Unique house style case. Loose leaf pages. 3 different colour sticky flags. 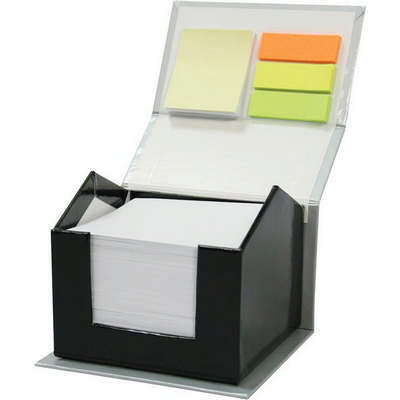 1 Sticky note pad. Product Size: 90 x 75 x 95mm. Product Packing: Bulk packed. Decoration Size: 70 x 40mm. Decoration Position: Roof/Top. Decoration Method: Pad Print. Carton Quantities: 48. Carton Size: 31 x 35 x 44. Carton Weight: 15. Colour: Black. Price includes : Pad Print 1 Colour / 1 Position. Setup is included.